We offer the full range of Pénichettes®. They are based on the traditional French barge, or Péniche, and their unique design gives superb visibility with light and airy living spaces. The Flying Bridge Pénichettes are the newest boats in the 15-model range. These provide inside and outside steering positions with mostly en-suite cabins. 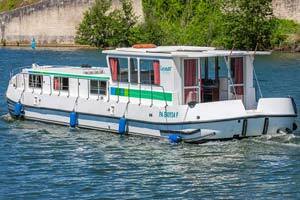 The R class Pénichettes are refurbished Classic boats with more recent equipment, eco-friendly and more efficient. They also have a radio/CD player and a bicycle rack. Across Europe there are now over 400 Pénichettes. Whether for couples, families or groups of friends there is always a Pénichette to suit your requirements. Check out the three styles from the details below. 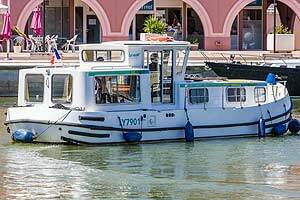 The name "Pénichette" is a Registered Trade Mark referring exclusively to the range of boats designed and built in France by Locaboat Plaisance. 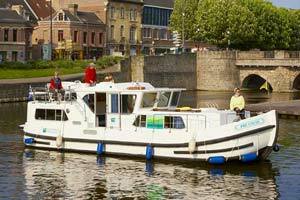 These boats have similarities to both compact barges and motor cruisers and provide comfortable accommodation for between 2 and 12 people. These are the very latest designs, exceptionally luxurious and well-equipped, with dual inside and outside steering positions. Ideal for 4 people. Special rates for 2. Superb boat with excellent space. Maximum comfort for 8 people. Bow thruster. Ideal for 2 couples and 2 singles with three cabins plus saloon. Bow thruster. Flexible space to sleep 1 couple and 4 singles up to 3 couples in 3 cabins. Bow thruster. Elegant, modern and spacious, with an aft deck that lengthens the kitchen and living space and provides shade for outdoor eating. These classic Pénichettes have become famous due to their resemblance to the 'Péniche' or working barge. Kitchen and sitting area at the rear of the boat is separated from the sleeping areas at the front. Central steering with large glass area. Ideal for a couple or for a couple with 1 child. Model entirely refurbished both inside and outside New or very recent equipment.